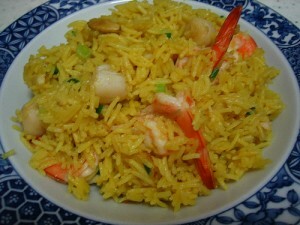 Seafood Rice recipe by Doctor Amir at DesiRecipes.com. IN A BIG PAN, DROP THE OLIVE OIL, FRY THE CHOPPED ONIONS AND THE CHILLI TILL IT GETS BROWN. ADD THE GREEN PEPPER IN IT AND ADD THE GARLIC AS WELL. FINALLY MIX THE DESIRE AMOUNT OF TOMATOES IN IT AND ADD THE CRAB IN IT. MIX THE GRATED CARROT IN IT, PUT HALF CUP WATER IN IT.ADD SALT N PEPPER IN IT. FINALLY ADD 8 GLASS OF WATER AND THE RICE LEAVE IT TO COOK FOR 20 MINUTES. MAKE SURE THE PAN WILL CONTINUE TO OPEN. ADD SAFFRON OR ZARDA COLOR. WATCH THE RICE UNTIL IS COOKED. LEAVE IT FOR ANOTHER 5 MINUTES UNTILL THE WATER IS SOAKED AND ENJOY THE HOT SEAFOOD RICE.